SAI Global, the peak safety certification body in Australiatoday confirmed that the Big Jim® range of Chainsaw Protective Clothing delivered certified performance to AS/NZS 4453.3:1997. Manufactured and distributed by Elliotts, one of Australia's leading suppliers of safety protective apparel, the Big Jim® range delivers improved performance utilising ArborTex High Performance Fabric to achieve a test result of no cut through to comply with the performance requirements of AS/NZS 4453. According to SAI Global program and technical manager Mr Paul Roberts, understanding exactly what level of protection various Chainsaw Protective Clothing provided the user was essential in protecting them from harm in the workplace. "Users of chainsaw protective clothing need to feel confident that the clothing they're wearing provides an adequate level of protection for the task they are undertaking and in terms of chainsaw protective clothing, we wish to confirm that Elliotts Big Jim® Chainsaw Protective Clothing has been tested and certified to AS/NZS 4453.3:1997 since October 2010," said Mr. Roberts. Elliotts Managing Director Anthony Elliott said the company remains committed to providing industry with high quality, certified protective clothing that meets and in some cases exceeds current safety standards. "At Elliotts, we have been manufacturing chainsaw protective clothing for over 30 years and providing workers in Australia with garments certified to standards continues to be uppermost in our minds," said Mr Elliott. 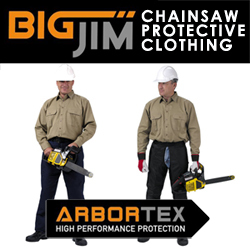 "For these reasons, we have always invested heavily in testing and certification and SAI Global's confirmation today of our Big Jim® Chainsaw chap ranges certification to AS/NZS 4453.3:1997 will provide users of Big Jim® chaps with peace of mind that these garments continue to protect them from harm," Mr Elliott said. Up until recently, Chainsaw Protective Clothing in Australia and New Zealand had been made to NZS 5840, a standard offering a lower level of protection for Chainsaw users than the more recently adopted AS/NZS 4453.3:1997. In 1997 a joint Australian and New Zealand standard was issued, AS/NZS 4453.3:1997, the performance requirements of which were superior to the requirements of NZS 5840 however this new standard could not be enforced due to the technical difficulties during the testing process. Whilst AS/NZS 4453.3:1997 was based on the European standard EN381, because of subtle differences testing facilities across Australia and New Zealand had been unable to test to the new standard. Mr Elliott said that given NZS 5840 remained the benchmark for Chainsaw protective performance, up until April 2010 Elliotts Chainsaw Protective Clothing had been made to meet the performance requirements of NZS 5840 and the design requirements of AS/NZS 4453. "Subsequently at that time, our Chainsaw clothing was manufactured utilising an Arbortex Protective Pad which passed NZS 5840 requirements with no cut through." Said Mr Elliott. "However, in December 2009 we discovered LASRA in New Zealand could now test to AS/NZS 4453 and we began testing our Chainsaw protective clothing in early 2010," he said. "Testing at that time showed that we needed to increase the performance of the ArborTex Protective Pad to achieve a test result of no cut through to comply with the performance requirements of AS/NZS 4453," he said. "We adopted this new level of performance in our range of Big Jim® Chainsaw Protective Clothing and had it certified to AS/NZS 4453.3:1997." CSC Style Chaps with quick release webbing strap and buckle closure. For further information, please visit elliottaustralia.com, contact your local distributor or Elliotts Customer Service on 07 3265 2944.